So How’s That Asset Allocation and Diversification Working Out For You? Since the market top in 2007 adherents to a buy and hope investment strategies have been pretty disappointed with their results. Headlines have asked “Is Buy and Hold Dead?” Trading has become king. The whole idea of a buy and hope with a diversified portfolio is that in using different asset classes, or types of investments, while one might be in decline, another will rise to smooth out the overall portfolios’ performance. Trouble is there hasn’t been much smoothing going on. Everything has been zigging and sagging at the same time. While this has been painfully obvious to those of us that watch the markets daily, it is always nice when someone actually runs the numbers and verifies what I’ve been observing. Below is a chart from www.chartoftheday.com who always seems to come up with a good chart to show what’s been happening in the markets. The blue line shows the correlation among the stocks in the S&P 500 since 1980. 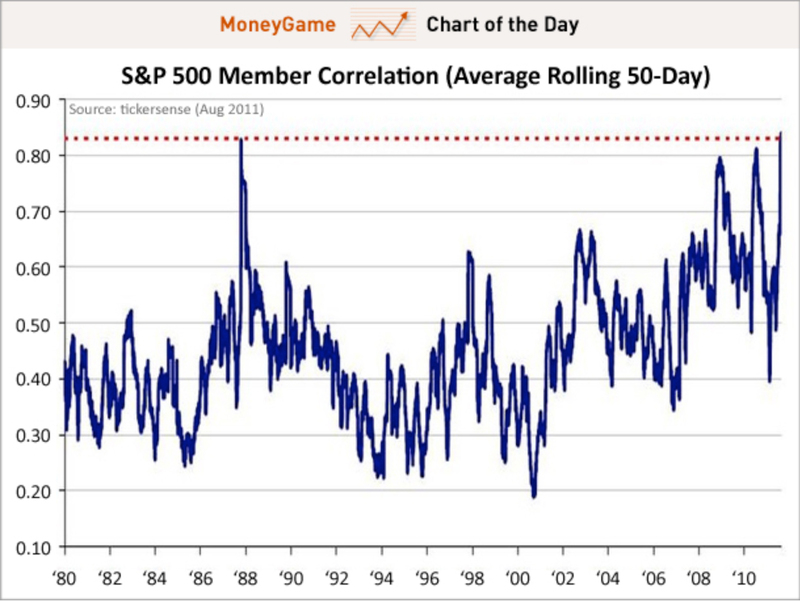 Correlation is how closely different stocks in the S&P 500 move together. Over the past month the correlation coefficient has popped up over the 80% level. Levels last seen during the stock market crash in 1987. There hasn’t been much zagging to offset the zigging since the pre-2006 time frame. What’s this mean to the average investor? Risk management is changing. The “easy” strategies that work in bull markets are falling apart. Partly due to the overall bear market, but also guilty is the advent of the high frequency traders. Traders that trade hundreds of thousands of shares a day making small per share profits, but on huge volumes of shares. The warning signs are clear, as we saw in the last post volatility is high and correlations are high, the only tools to reduce risk are hedging strategies, dividend strategies, and holding cash that all help to dampen volatility. Strategies that we use at 401 Advisor, LLC for our client portfolios.